I’m a history lover. And like most history buffs my age, I am a critic of one of the most influential Virginians in American history. Thomas Jefferson’s popularity comes in generational waves; the catchiness of Hamilton: An American Musical and critical scholarship concerning Jefferson’s views of slavery have tainted his image to the eye of the average Millennial. With The Private Jefferson, the Virginia Historical Society finds a perfect balance of Thomas Jefferson, the man, and Thomas Jefferson, the American hero. The exhibit consists of Jefferson’s personal writings and sketches. The curators offer little editorial in their descriptions, focusing instead on decoding complex syntax and Jefferson’s hurried handwriting. This straightforward delivery transports the viewer into the life of a farmer, architect, philosopher, and Founder. I wasn’t learning about what we think about Jefferson, as one would in a history textbook; I was learning about what Jefferson thought we, Americans, would one day become. More than a portrait of a single Founding Father, the Private Jefferson paints a portrait of a privileged and complex American life. 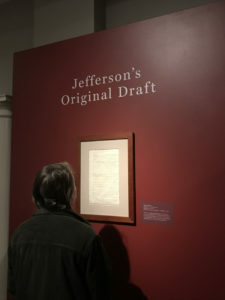 The first draft of the Declaration of Independence and the early plans for Monticello are must-sees, but the real value of the exhibit lies in Jefferson’s letters to his kin. One correspondence with his granddaughter reads “in about three weeks I hope to be with you, and then we shall properly be devoted to the garden,” showing us the more tender side of a usually stoic and solemn figure. Conversely, a letter to his son-in-law details how best to discipline slaves to ensure obedience and subservience. 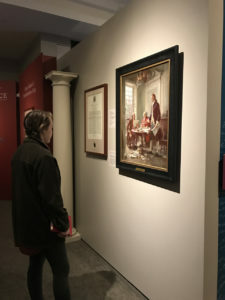 I am grateful that the Virginia Historical Society has given Virginians a chance to view the private writings of Thomas Jefferson in the context of the modern political and social atmosphere. Never before has it been so easy to step into Jefferson’s Virginia, as nuanced and controversial as it is. 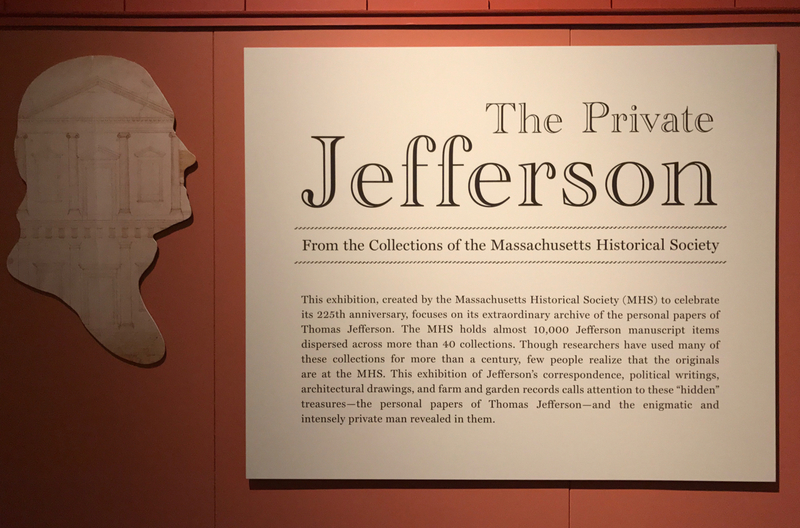 You can see the Private Jefferson at the Virginia Historical Society through January 22. Tickets to this exhibit, originally organized by the Massachusetts Historical Society, can be purchased independently or in conjunction with a VHS membership. Click for details.